Asian cabbage salad is a delightful salad and mates perfectly with the crunchy noodles. 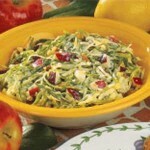 Great as a side dish for meat or chicken or anything else or in combination with other salads. Lettuce accompanied with nuts and chick peas fully coated with sweetened mayo. The fresh flavor and crunchy texture of garden vegetables star in this colorful coleslaw. Lightly dressed with vinegar and cream, it gives a refreshing touch to your meal.